Quick question: Who holds the most data about you? Applefacebookgoogle has a great deal of it, but chances are it doesn’t have the goods about every single area of your life, from employment and income and taxes to what prescription drugs you take and what charitable donations you’ve made in the past five years. For data to that depth, you’d have to look to the Government. The Government hasn’t traditionally been seen as a thought leader when it comes to data security. However, this has been changing of late. The Government of Canada sees that it has a huge role to play in pushing digital literacy, establishing best practices around data management, and generally leading by example by dedicating itself to the prevention of cybercrime. In one project, the Smart Cities Challenge, the Government of Canada challenged communities across the nation to come up with ideas to improve the lives of Canadians using data and connected technology. In a ransomware and WikiLeaks world, such commitment on the part of the Government to lead the effort to make data more secure is coming at the right time. Public-sector organizations are no different from private-sector organizations in that they couldn’t function without information — informed decisions could not be made; legislation could not be passed, let alone enforced; and citizens would not be served. 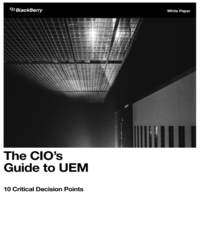 In order to derive the most value from its information, a public-sector company must actively manage its data from the moment it collects it to the point where it is no longer essential to operations. In a world where the General Data Protection Regulation (GDPR), PIPEDA, and third-party authentication are part of the conversation — but not necessarily understood — the industry is creating new options around the management of information according to regulations. 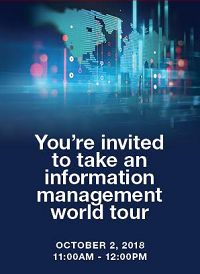 On Tuesday, October 2nd, join Ian Owen, Public Sector Industry Specialist, Open Text, for a webinar world tour of jurisdictions that are taking the lead when it comes to information management in the public sector. During this fascinating session you’ll hear what Madrid, Barcelona, Singapore, the Western Cape Government in Africa, Los Angeles, New Zealand Transport, the U.S. Department of the Interior, and the Region of Peel (Greater Toronto Area) are doing to provide services to their staff and to citizens.